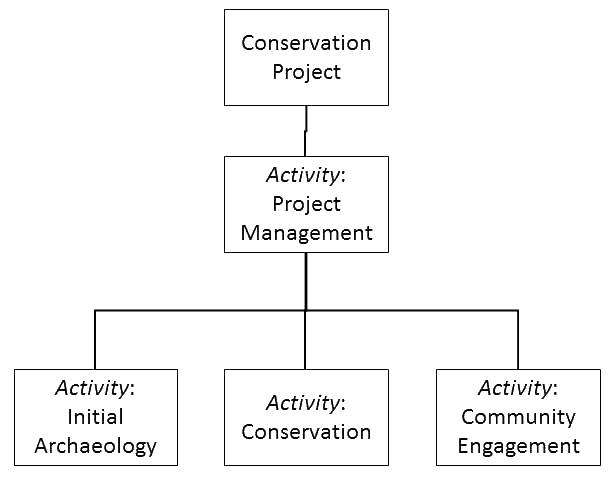 The Conservation Project will be managed by a dedicated project manager who will oversee all tasks and activities. Supporting administration will be directly overseen by the trustees; indeed, in many cases individual activities will be managed by named trustees. To ensure the project is efficiently and effectively undertaken. To promote the project to the public to help ensure its aims and activities are understood. To work with local organisations (including local schools and societies) to ensure they are informed, involved and engaged. To ensure that contracts are legal, appropriate and properly costed. To ensure that services and goods are appropriately procured and delivered. To ensure that agreed project activities and tasks are coordinated, completed on time, within budget and to an appropriate quality (project management). Each of these activities is discussed in greater detail in the sections below. 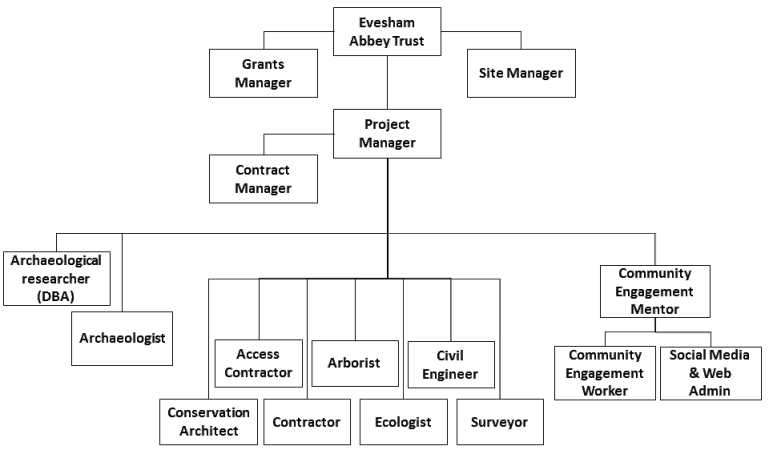 The Evesham Abbey Trust is a new organisation and has few established resources. The success of the project is highly dependent on securing funds from grant-making and other bodies. This is a very significant heritage project and it is important that the public are keep fully informed of its progress and results, including work on fabric repairs, finds from the archaeology and, perhaps most importantly, letting people know how they can become involved. This area will be supported by a working group of volunteers working with the trustee Barrie Baldelli, who is a local journalist with a background in community work. Working closely with local groups – from schools to the local media – is a key area to ensure that local groups have the opportunity to engage with the project. Some of this work will be covered with PR, marketing and promotion. However, there are additional tasks in terms of engagement and liaison which need to be carefully and separately managed. This area will be overseen by Barrie Baldelli, supported by trustees Steve Davies and Elizabeth Spencer. Best value for money must be demanded from suppliers and contractors, and this requires an experienced assessment of both what is required, what it ought to cost, and what can be provided by different organisations. Additionally, grant-making bodies are keen to ensure that they are receiving maximum impact for their charitable giving. Contract management helps ensure that funds received are effectively applied to achieve the right results. This area will be managed by the trustee Mike Owens FRICS supported by fellow trustee Tony Haugh FCIOB MRICS (retd.). There two trustees are both chartered surveyors with extensive experience in contract management. The previous activities – finance, fund-raising, liaison, procurement, etc. – aim to enable the execution of the project. However, there are a range of dedicated management tasks which are concerned purely with ensuring that activities and tasks are completed on time, on budget, and to the right quality. Additionally, it is important to ensure effective communications between tasks and parties, and that any risks are promptly identified and effectively mitigated. A professional Project Manager will be employed in this role. The close involvement of the trustees in administration activities means that the trust will be promptly and closely involved not only in ongoing operations but also in the handling of issues, risks, concerns and/or opportunities. For further details of the operational activities please see the sections on initial archaeology, fabric repairs, and community engagement.